Incidence rates of melanoma continue to climb, and while most patients are diagnosed at an early stage, once metastatic, melanoma remains the most deadly of all the cutaneous malignancies. With the discovery of immune checkpoints and therapies that target the MAPK pathway, patients with metastatic melanoma have new treatment options and renewed hope. This presentation reviews current treatments for early-stage and relapsed/refractory diffuse large B-cell lymphoma and mantle cell lymphoma. Emerging therapies, including CAR T-cell therapy, along with patient selection criteria and toxicities unique to new treatments are addressed as well. Dive into current strategies for managing patients with chronic lymphocytic leukemia and follicular lymphoma, including the risk-adapted treatment selection of new therapies based on factors such as patient age, performance status, and comorbidities. 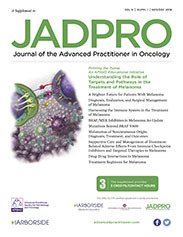 The latest data on the efficacy and safety of newly approved agents are presented, and strategies to treat common side effects reviewed. The overall survival of patients with multiple myeloma has increased within the past decade, thanks to newer agents such as immunomodulatory drugs and proteasome inhibitors. Receive updated data on key FDA approvals and practice updates for maximizing therapies while mitigating adverse events. In this lecture, learn about the principles of treatment for relapsed/refractory classical Hodgkin lymphoma, including therapeutic targets and mechanisms of action of newly approved agents in order to educate and manage patients effectively. Hear from an expert in the field on best practices for treating immune-related adverse events such as pneumonitis, hyperthyroidism, and colitis. Get an overview of the diagnostic criteria and key clinical trials for Philadelphia chromosome–negative classical myeloproliferative neoplasms: polycythemia vera, essential thrombocythemia, and myelofibrosis. Learn about the role of the JAK-STAT signaling pathway, as well as strategies for optimizing the selection and sequencing of treatments for patients with myeloproliferative neoplasms. Acute myeloid leukemia is a heterogenous group of distinct malignancies that accounts for 80% of acute leukemias in adults. Recent advancements in diagnostic tests, such as next-generation sequencing, have led to the identification of unique biomarkers associated with acute myeloid leukemia. These advancements, along with new targeted therapies, offer hope for a greater impact of survival for patients with this disease. This lecture provides a comprehensive overview of the immune system and current immunotherapeutic strategies, including discussions on the difference between innate and adaptive immunity, significance of neoantigens, and emerging checkpoint inhibitors. There are several treatment-related issues that advanced practitioners caring for patients with cancer should be aware of. Factors predictive of response to immunotherapy, different combinations of treatments, and immunotherapy response patterns are reviewed. Immunotherapy has been the source of promising new cancer treatments, but carries with it a host of side effects that can affect any organ system. The range of possible side effects makes it important for advanced practitioners to understand the timing and incidence of immune-related adverse events, as well as to recognize and manage these adverse events for patients to receive the full benefit of their treatment. 40% of patients develop metastasis after primary surgical resection of localized renal cell carcinoma (RCC); this signifies an unmet need for the treatment of metastatic RCC. The mainstay of treatment has been antiangiogenic agents for previously untreated patients, and nivolumab has been shown to improve survival for patients who received prior antiangiogenic therapy. Details on the clinical trial upon which FDA approval for nivolumab was based on, as well as a case study illustrating how to appropriately manage immune-related dermatitis and arthritis are discussed in this video. The role of immunotherapy in non–small cell lung cancer has been rapidly expanding as results from several clinical trials have come out in recent years. Takeaways from these studies and a differential diagnosis of a case study patient with anemia and nephritis demonstrate key points advanced practitioners should be aware of when managing this patient population. Melanoma is one of the few malignancies where the incidence is on the rise. In this case-based lecture, approved immunotherapies for the treatment of patients with melanoma are discussed, and a case study of a patient with stage IV melanoma complaining of fever, cough, and shortness of breath is presented. The use of immune checkpoint inhibitors is emerging as an effective strategy to treat patients with mismatch repair–deficient and microsatellite instability–high tumors. This presentation summarizes data on currently available immunotherapeutic agents for these tumors and details the appropriate management of immune-related hypothyroidism. After decades of no new approvals for the treatment of metastatic urothelial cancer, a malignancy associated with a low survival rate, novel immunotherapeutic agents are changing the treatment landscape for bladder cancer. Learn about the therapies showing activity in this malignancy and get clinical pearls on how to manage a patient with urothelial cancer with immune-related hepatitis and pancreatitis.